A truck carrying goods and migrants drives through Niger's Tenere desert region of the south central Sahara on June 3, 2018. Once a well-worn roadway for overlander tourists, the highway’s 2,800 miles are a favored path for migrants heading north in hopes of a better life and more recently thousands who are being expelled south from Algeria. It has become the deadliest migration route in the world. Over the past 14 months, more than 13,000 migrants and refugees have been driven to the Algerian border and forced to retrace their routes across the Sahara Desert in Niger, according to the Associated Press. It’s part of a massive migrant expulsion campaign to deter travel into and through Algeria. But while migrants came to Algeria by vehicle, their return journeys are generally by foot with little or no water in temperatures that rise to 118 degrees Fahrenheit (48 degrees Celsius). Janet Kamara in Niger, June 2018. 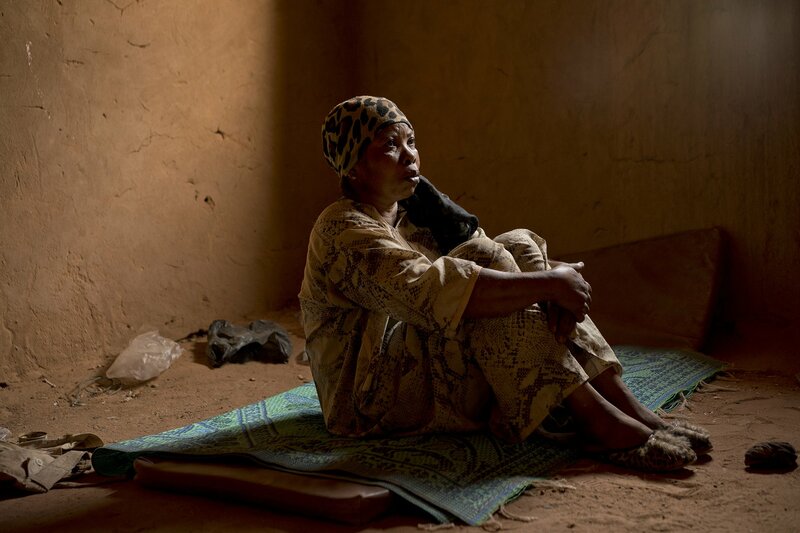 Kamara was expelled from Algeria and left stranded in the Sahara while pregnant. "Our baby was killed, women were lying dead, men. ...Other people got missing in the desert because they didn't know the way," she says. Since Algeria began the expulsions in 2014, an estimated 30,000 people have gone missing in the desert, according to the AP. They are believed to have perished in the blistering heat and powerful dust storms, which shrivel and bury dead bodies, according to the International Organization for Migration, who worked with the AP on this report. That’s nearly twice as many migrants and refugees who have died trying to cross the Mediterranean Sea during the same period, making this the deadliest migratory route in the world. Migrants and refugees are going to Algeria in the first place to flee violence or to seek opportunity, according to Al Jazeera. Their wholesale expulsion is in response to pressure from the European Union to curb migration into the continent, because many migrants travel through Algeria on their way to Spain, Italy, or elsewhere, the AP reports. The catastrophic consequences resemble the horrors that have occurred in Libya after the EU pushed for similar policies of deterrence. Niger has also pressured Algeria to return Nigeriens who cross into the country. As a result, some migrants are driven hundreds of miles back into Niger in open-back trucks, and many die along the way, the AP reports. The migrants who are dropped off at the border are forced at gunpoint to begin their trek toward towns miles away. These small border towns are overwhelmed by the influx of abandoned migrants in desperate need of medical attention, food, and water. Thousands of #migrants have been expelled from Algeria into the Sahara desert... some at gunpoint, forced to walk 15km to the nearest town. Many migrants feel so bereft of opportunity that they pay smugglers to once more usher them into Algeria, despite the risks. The AP describes pregnant women whose newborns died in the desert, men and women who simply gave up and collapsed in the sand to die, and others who became lost in the blinding dust storms. The IOM is conducting emergency missions throughout the area and sends rescue convoys into the desert whenever a new group of migrants enters a Nigerien town. Algeria has so far declined to speak with the AP and has denied the events, accusing the IOM of fabricating the details. The ongoing humanitarian crisis is part of a much broader situation unfolding around the world involving migrants, asylum seekers, refugees, borders, and harsh enforcement of immigration laws. 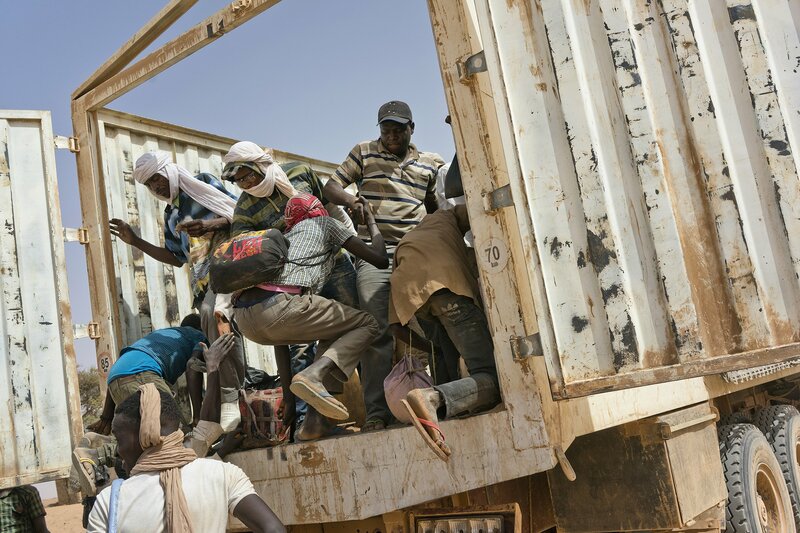 Migrants climb into a truck to head north into Algeria at the Assamaka border post in northern Niger on Sunday, June 3, 2018. Globally, more than 65.8 million people are displaced, including 25.4 million refugees, according to UNHCR, the UN refugee agency. More than 214 million people, meanwhile, are migrants. These numbers have been growing steadily since 2000 and they show no signs of slowing down as conflicts, political instability, natural disasters, and climate change drive more people from their homes, according to the UN. At the same time, countries such as Myanmar, Hungary, Italy, the US, and Colombia are bracing their borders against the perceived threat of people fleeing violence and extreme suffering or seeking opportunity. The situation unfolding in the Sahara — as cruel and unnecessary as it seems — is simply one of the most grisly examples of a global phenomenon. Global Citizen campaigns to help refugees and migrants and you can take action on this issue here.